The Abbey Stadium as it is today. Photo: Alix Dorrington. Following Midsummer Common, Stourbridge Common, Parker's Piece and the Celery Trenches, Abbey United settled on their current site in the 1930s. 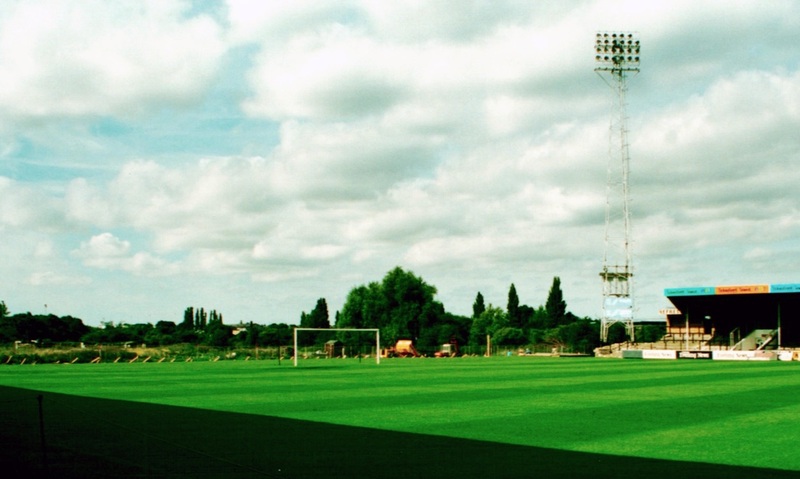 With a revamp of the Abbey Stadium on the horizon, Andrew Bennett here provides a blow-by-blow account of his beloved Wembley of the Fens, home of the U's. 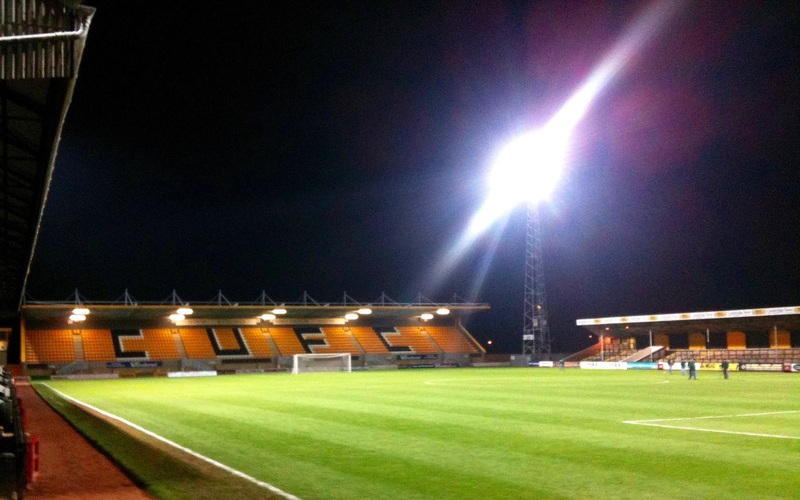 ​Cambridge United were formed as Abbey United in 1912 and played their first friendlies on Midsummer Common in the centre of the city. After the World War I they reformed and made their home on Stourbridge Common, home to the largest fair in Europe in the Middle Ages, which inspired the Vanity Fair described by John Bunyan in The Pilgrim’s Progress. United joined the Cambridgeshire League in 1921 and two years later obtained the first ground of their own at Station Farm, off Newmarket Road in Barnwell. It swiftly became known as the Celery Trenches because of the furrows along the pitch that filled with water when it rained and, with a distinct slope from end to end, the surface gave United a marked advantage over visiting teams. 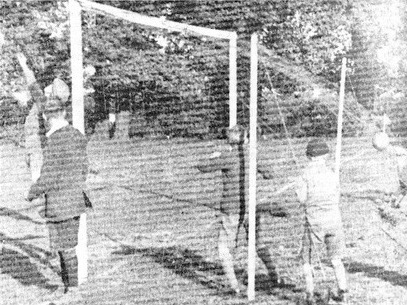 In time, though, the facilities became just too shabby and in 1930 the team moved to Parker’s Piece, where the original ‘Cambridge Rules’ of modern football had been posted in 1848. In the summer of 1931, club president Henry Clement Francis acquired some land very close to the Celery Trenches known as Sindall’s Field and offered the club two choices: they could accept the whole site, undeveloped, or take a smaller parcel of land on which he would erect a fence and a grandstand for spectators. They accepted the latter option. The pitch did not directly abut Newmarket Road but lay behind a large house known as the Old Gardens, which had possessed a tea garden with a summerhouse that people would visit at weekends (see History: early days). The ground was accessed via a path between the Gardens and Sindall’s Works (which later became a Corona factory) next door. Directly to the east was Marshall’s Aerodrome, which the company vacated in 1938 to move further down Newmarket Road, and the Whitehill Estate was built on the site. ​It took a year for the pitch and ground to take shape, during which the club temporarily moved back to the Celery Trenches. 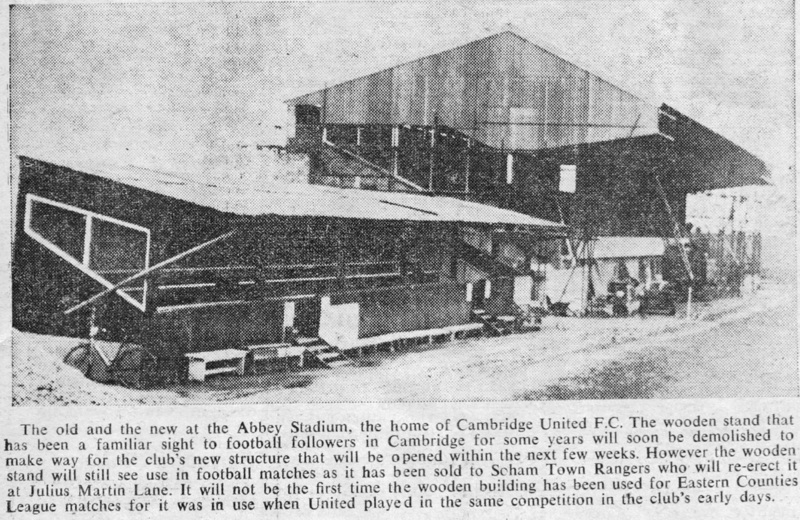 Abbey United’s new home was officially opened with a friendly against Cambridge University Press on 31 August 1932. Facilities at the new ground were at first basic to say the least. The changing room was a green-painted wooden hut near the halfway line on the site of what is now the Habbin Stand, with a household bath heated by a wood fire; towards the end of a match smoke would begin to emanate from its chimney to indicate that the ‘facilities’ were being prepared for the players. The hut had been put up by a couple of players, the Taverner brothers. ​A wooden stand, seating 238 spectators, was opened on 19 March 1934 for a league match against Gamlingay. Admission to the ground was 4d, or 2d for ladies, juveniles and the unemployed (on production of card), with an additional charge of 3d to sit in the new luxury facility. The club needed to keep the ground open during World War II, because if it was not used regularly it could have been requisitioned for military use. They formed an alliance with the local RAF, who became ‘co-partners of the ground’ and staged regular friendlies and Emergency League games there subject to availability. On one occasion Abbey fielded a side that included seven Aston Villa players, when the Birmingham battalion they had all joined together was stationed in Barnwell Road. Henry Clement Francis died on 13 February 1940 at the age of 83, and his solicitors advised the club that the football ground had been left in trust to the Mayor of Cambridge, the Vicar of Fen Ditton and the District Nursing Association, to be used for grazing and football by Abbey United for a nominal annual rent of half-a-crown (12.5p). The ‘grazing’ part was significant, as in the absence of any mechanical means to keep the grass even, sheep were left to graze on the pitch all day on a Friday, courtesy of Mr Fison of Fen Ditton. Committee members would then clear the field of droppings on a Saturday morning, in preparation for the match. After the war, United’s ground remained spartan in its facilities. It had only one entrance, from Newmarket Road, and just inside there was a long low wooden shed to the right which served to offer refreshments, while much further down the same side stood the changing rooms, with a fenced enclosure for players and officials. 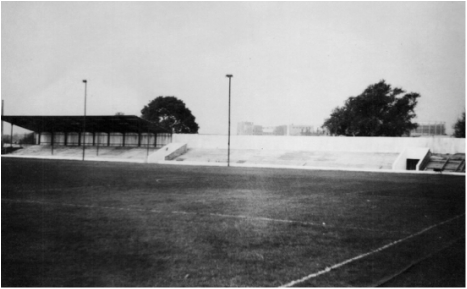 The lone stand stood on the opposite side of the pitch, where the Main Stand is now, and a wooden fence separated the ground from the allotments. The only known photograph of the Celery Trenches, Abbey United's home before the 1932 opening of the future Abbey Stadium. It was located to the east of, and very close to, the current ground. 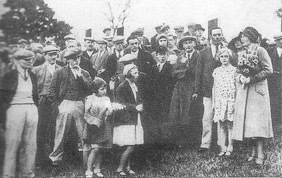 Mrs KRJ Saxon (right), daughter of Abbey United president Henry Clement Francis, opens the Newmarket Road ground on 31 August 1932. 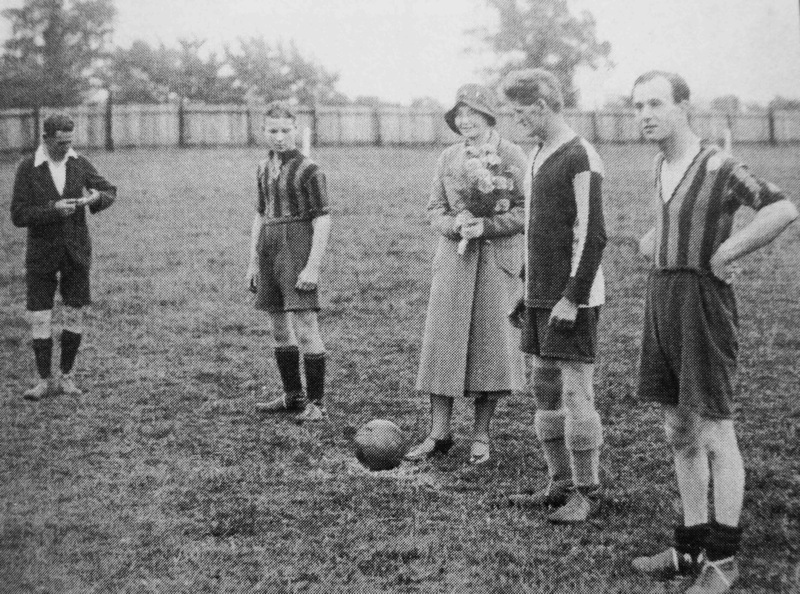 Mrs Saxon kicks off the first match at the new ground on 31 August 1932, watched by Abbey player Harvey Cornwell. 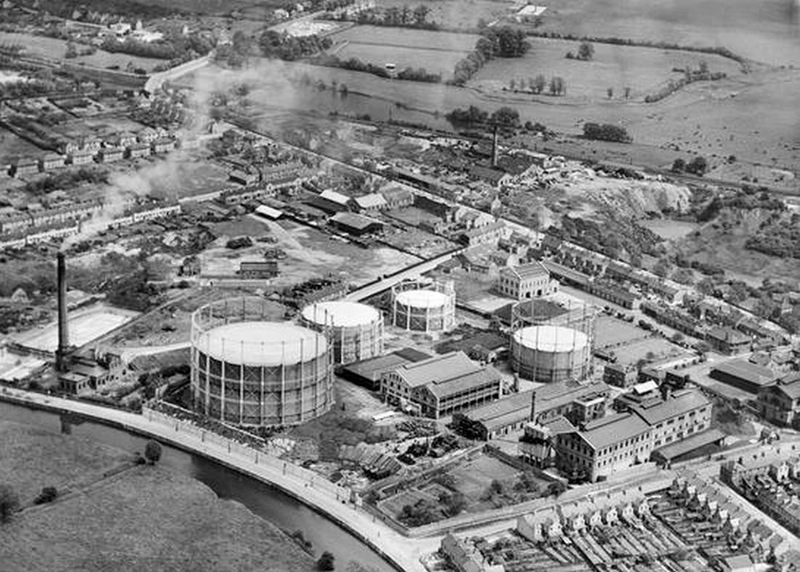 In this 1933 aerial shot of the Barnwell area, Abbey United's Newmarket Road ground can be seen the field top centre, above and to the right of the cloud of smoke from the sewage pumping station chimney. Photo: Aerofilms/Britain from Above. Abbey United's first grandstand was a wooden, 238-seat structure. It opened on 19 March 1934. As yet there were no turnstiles; instead there was a wooden hut with three pigeonholes, while a second entrance to the ground was opened along an unadopted gravel lane some 50 yards along the main road, known as Cut Throat Lane. The Newmarket Road end terrace was enhanced with concrete and when United drew Wisbech Town in the FA Cup the banking on the other sides of the ground was also improved, allowing spectators a good view even when standing six or seven deep. The club changed its name to Cambridge United in 1951 and switched to the Eastern Counties League. A pavilion, canteen and clubroom for the Supporters’ Club at the front of the football ground was completed in April 1952, built entirely by unpaid volunteers, and during that summer they were active again, levelling and draining the playing area and squaring it up properly for the first time, as well as constructing new terracing at the Coldhams Common (Allotments) end with capacity for 1,500 spectators. A new entrance and pay box, plus a park for bicycles, had also been built here. The club’s board continued to display its ambition by setting its sights on a 15-acre site on Stourbridge Common as a new, larger ground on which to play, but Cambridge City Council would not release the land. 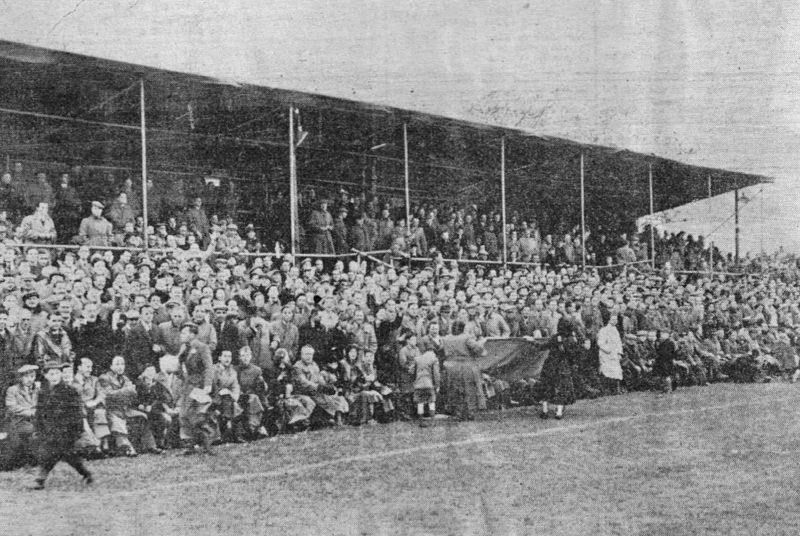 An FA Cup run during 1953/54 saw a new attendance record of 7,500 set against Newport County, and it was increased to 10,000 in the following round against Bradford Park Avenue, when the club built a new temporary stand with covered and seated accommodation for 360 people; it was quickly nicknamed the Coronation Stand after Queen Elizabeth II’s accession to the throne six months earlier. It cost a mammoth 12s 6d for supporters to access due to the great cost of obtaining it, but it sold out, and it was also used for the following two league games before being taken down. 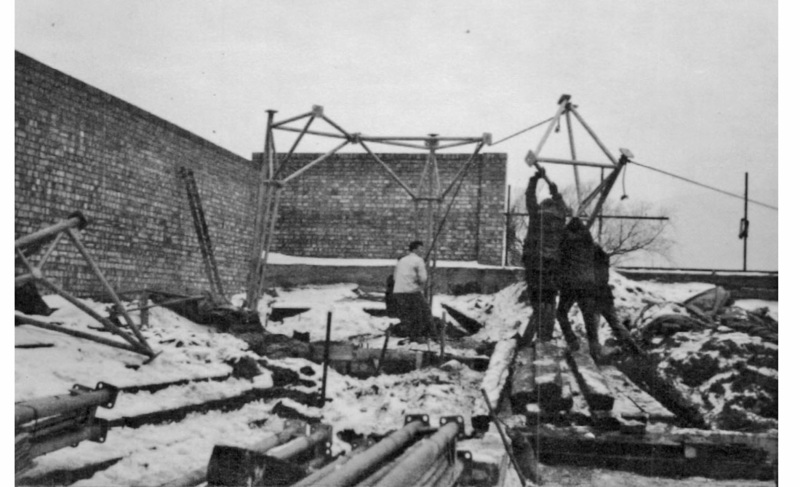 Temporary stand erected for Abbey United's FA Cup second round tie against Bradford Park Avenue on 12 December 1953. The game attracted a record attendance of 10,000. The view from the ground's north-east corner across the pitch to the Coldhams Common side – with the changing rooms visible – and the Allotments End. Date unknown. Those energetic volunteers were busy again during the summer of 1954, creating more terracing and a wall behind the Newmarket Road end goal in anticipation of the raising of a roof (erected by contractors in October). Drainage work on the pitch was also carried out and a start was made on the building of walls near the Newmarket Road entrance and at the far end of the ground. The Supporters’ Club approached Jewsons of Norwich to design the new stand, and the company agreed that the footings, brickwork and terracing could be carried out by supporters, under their guidance, in order to reduce costs. Their quotation to supply and erect steel stanchions and roof supports and covering came to £1,250, way beyond the club’s resources, but Jewsons kindly agreed to carry out the work for £250 with the balance to be paid off at £50 per month. In 1957 new dressing rooms and a boardroom – created from a wooden hut 40ft long and 18ft wide that had been purchased from a disused army base in Quy – were built at the main entrance. The asking price was £40 provided the Supporters’ Club dismantled the hut and transported it themselves; this was done in record time by gangs of supporters, and foundations were laid and the hut reassembled at the ground. With the completion of the foundations for the retaining wall on the City side, the pitch could be moved 14 feet, so that the east side was now large enough to contain a larger replacement stand in due course. 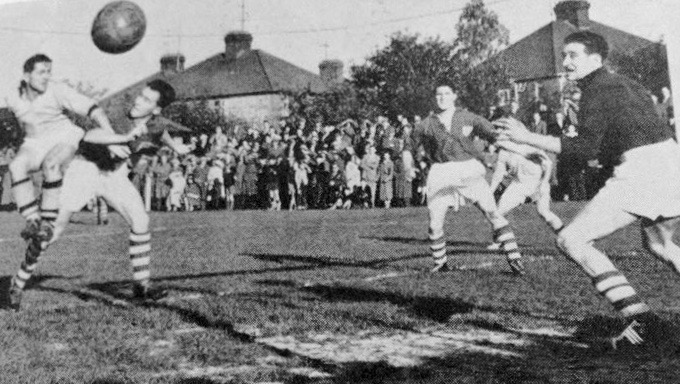 Russell Crane (left) heads for goal in a Cambs Invitation Cup game against Cambridge City on Saturday, 19 October 1957. Spectating conditions for the crowd of 4,900 on the Elfleda Road side of the ground were still fairly spartan. Photo: Cambridge Daily News. 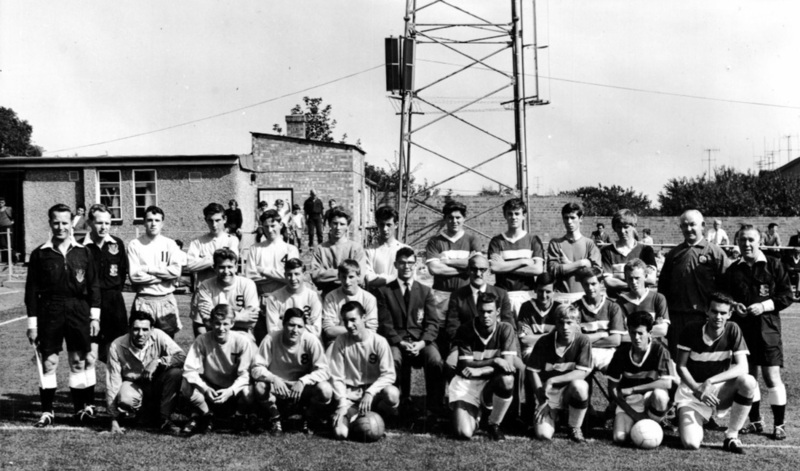 Cambridge United take on March Town United on 24 September 1960, with 'telegraph pole' floodlights and main stand in the background. Photo source unknown. In October of that year United were due to stage a benefit match for Len Saward against his brother Pat’s Aston Villa, and Len used some of his testimonial fund to purchase the club’s first set of ‘floodlights’. The primitive lights, consisting of lamps perched on top of telegraph poles, cost £14 each, but Villa were unable to make the date so the lights’ first use, and the first ever floodlit match at Newmarket Road, took place a week later, on October 21. Fittingly, Saward scored the first goal in a 3-0 victory over Great Yarmouth Town in the East Anglian Cup first round replay, and he subsequently sold the lights to the club. The north-west corner of the Newmarket Road ground and the Supporters' Club building. Date unknown. Steelwork for the roof of the second stage of the Habbin terrace was erected by Mackays. Photo: Len Day. Festivities at the Abbey United ground in the early 1950s. Perhaps it was to celebrate the coronation of Queen Elizabeth II in June 1953. Photo: Cambridgeshire Collection, Central Library. 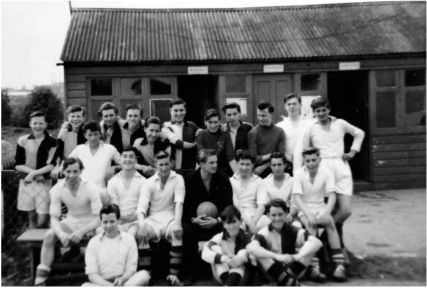 This early 1950s photograph shows boys from the Central Youth Centre, York Street in front of the wooden hut that served as changing rooms. Photo courtesy of Tony Collins. Cambridge United Supporters' Club 'Old Faithful' canteen was built in 1953 at the north-west corner of the ground, and demolished in 1962. 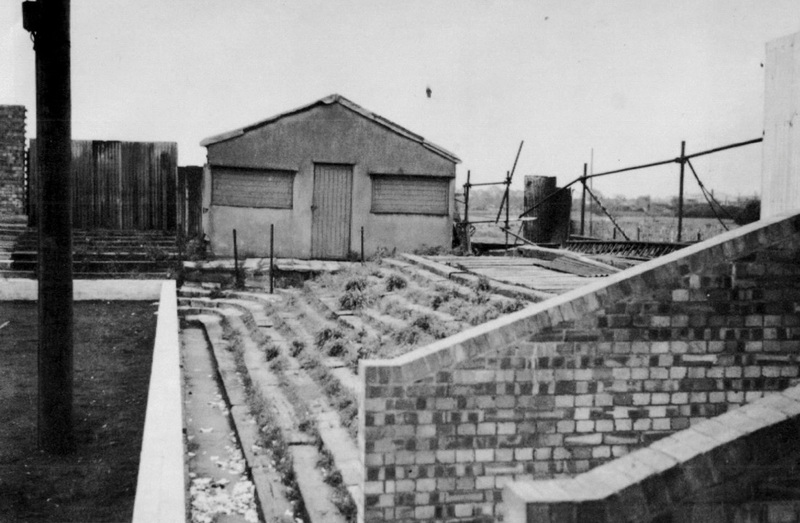 Above and below, work on the Newmarket Road end terrace, wall and roof was begun in the summer of 1954. Photos: Swainland donation, Cambridgeshire Collection, Cambridge Central Library. 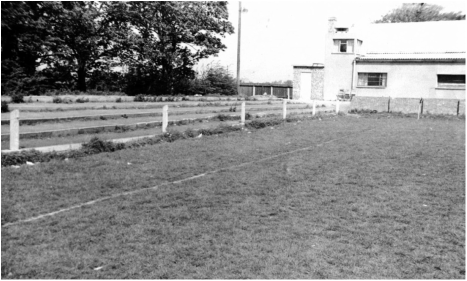 This photograph from 29 August 1964 shows the dressing-room and boardroom building in the north-east corner of the ground, built in 1957, and one of the new floodlight pylons, which were ready for use at the start of the 1964/65 season. The occasion was Cambridge United Youth against Chelmsford City Youth, which finished in a 3-3 draw. 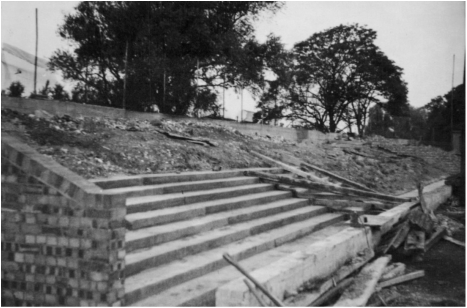 The replacement of railway sleepers on the central section of the Coldhams Common side of the ground started in November 1959 and was completed the following summer. Photo: Len Day. To build the Habbin terracing, 'Oughta Club' members used portable timber shutters and mixed concrete by hand. The concrete was wheelbarrowed in during the evening and the shutters removed, ready for the next section, the next morning. The group of volunteers cheerfully dubbed themselves the Oughta Club because they continually told each other: ‘You oughta do this, you oughta do that.’ They used portable timber shutters to build the terraces, mixing the concrete by hand and transporting it into place late into the evenings. The following morning the shutters would be struck and moved into position for the next load of concrete. In the New Year contractors erected new entrances and pay boxes on that side. 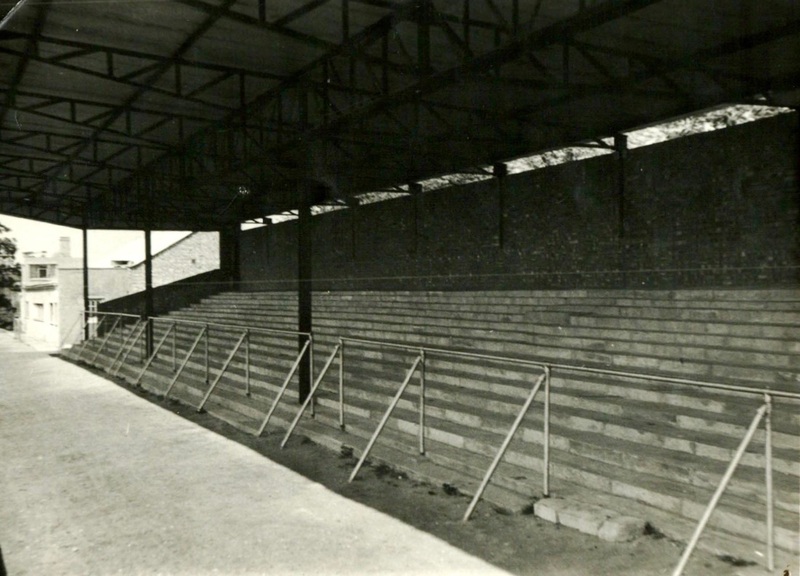 The first central bay of new concrete terracing on the Coldhams Common side was completed for the start of the 1960/61 season. The old dressing rooms were dismantled and all was ready to start putting a roof on that side thanks to the fundraising efforts of the Supporters’ Club. Delays in obtaining planning permission, however, meant that the project had to wait until the end of the season. Players were roped in to help the Oughta Club and the second stage was completed during the summer of 1962. The Supporters’ Club had paid for all the materials and provided the labour, and five years later the stand was named the Habbin Stand in honour of its first president, Harry Habbin. 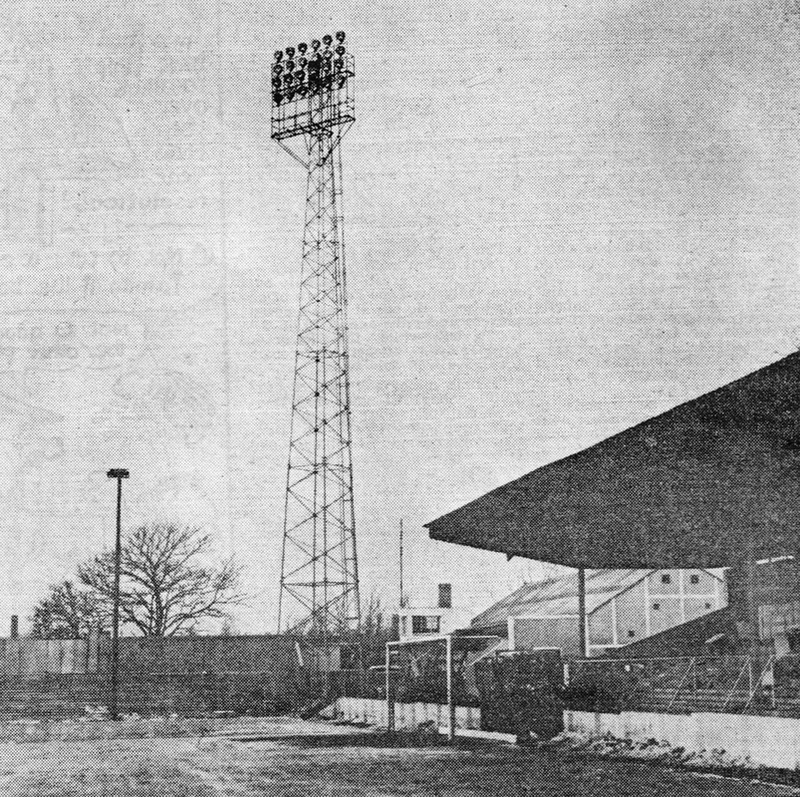 ​In December 1962 the Supporters’ Club started a Floodlight Fund; the existing Heath Robinsonesque system was not suitable for the Southern League. Reference was made to ‘The New Abbey Stadium’ project – the first time that name had been used for the Newmarket Road ground. Apart from the Floodlight Fund, it involved extending the cover over the Coldhams Common side terrace, and an order was placed with local firm Mackays in February for a further 120 feet of steelwork for construction to start straight after the end of the season in May. The stated aim was ‘to make our Stadium one of the finest in football’. 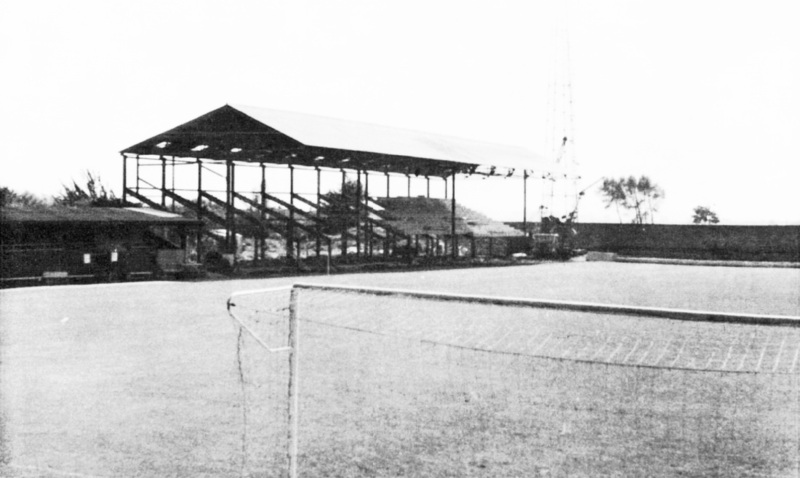 Phase two of the Habbin Stand roof was completed by Mackays in time for the start of the 1962/63 season, with the ground now able to offer cover for 6,000 spectators, and phase three was finished the following summer. At the end of November the success of the Floodlight Fund enabled the Supporters’ Club to hand over £4,000 to enable the club to place an order for four steel pylons, 80 feet high, and floodlights costing £13,500, with 24 lights on each pylon. The lights were up by the start of the 1964/65 season. In 1964 the Supporters’ Club purchased the Old Gardens, the house in front of the United ground, and its eventual demolition and clearance opened up the front of the ground to Newmarket Road for use as a car park. A Cambridge Evening News sports edition picture story of 12 January 1963 showed progress on the Abbey Stadium floodlights. 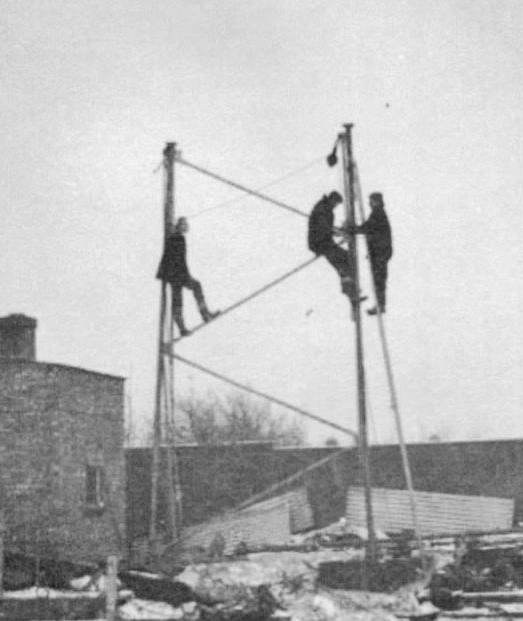 Above and below, the exceptionally severe winter of 1962/1963 saw work start on Cambridge United's new floodlights. Players and supporters dug the foundations and helped to erect steel sections of the pylons. Photos: Len Day. ​The following year construction work began on a new 1,500-capacity covered, seated main stand along half of one side of the pitch, necessitating the destruction of a section of open terracing so that the original 1930s stand could be moved on rollers towards the dressing rooms to make room for the new development. Just the middle section opened on 21 February 1966, while the changing rooms and offices underneath were not completed until the start of the 1967/68 season. By that time, the old wooden stand had been sold to Soham Town Rangers, and a further extension had been made to the Habbin Stand’s cover. In 1969 the Supporters’ Club gained an extra lounge with an extension for its ever-expanding membership, and facilities in the Main Stand were enhanced with the construction of a new ground-level seated enclosure at its front to provide accommodation for elderly or infirm spectators unable to negotiate the staircase leading into the existing seats. 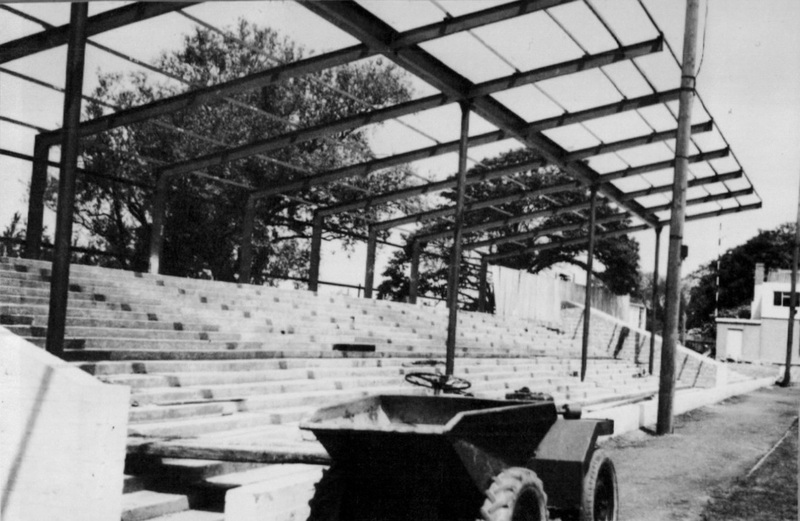 The new main stand almost ready for the start of the 1967/68 season. 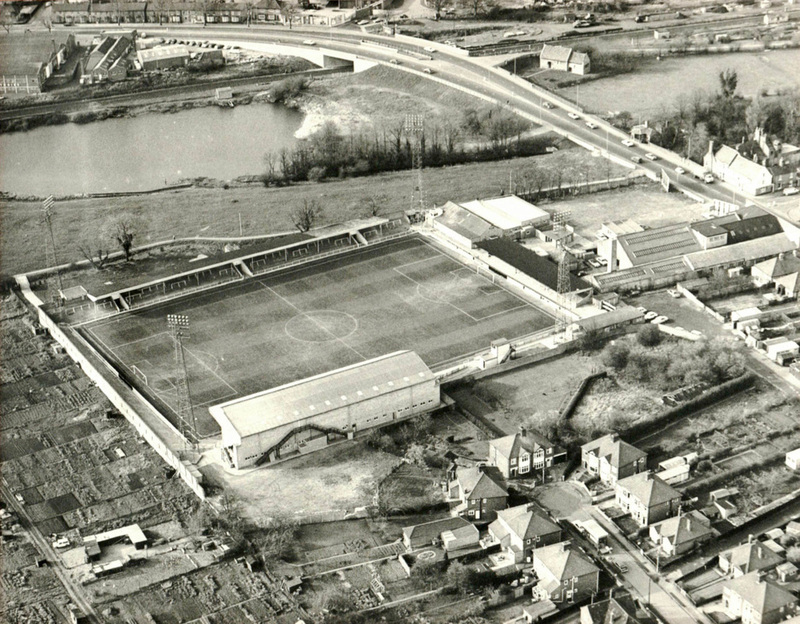 Click on the image to enlarge and pick out other landmarks: the Supporters' Club at the north-west corner of the ground; the Corona soft drinks works to its right; Elfleda Road bottom right; the Leper Chapel top right; the Allotments End terrace long before the construction of the South Stand; Barnwell Pit and pre-retail park buildings, top left. Photo: Cambridge Evening News. 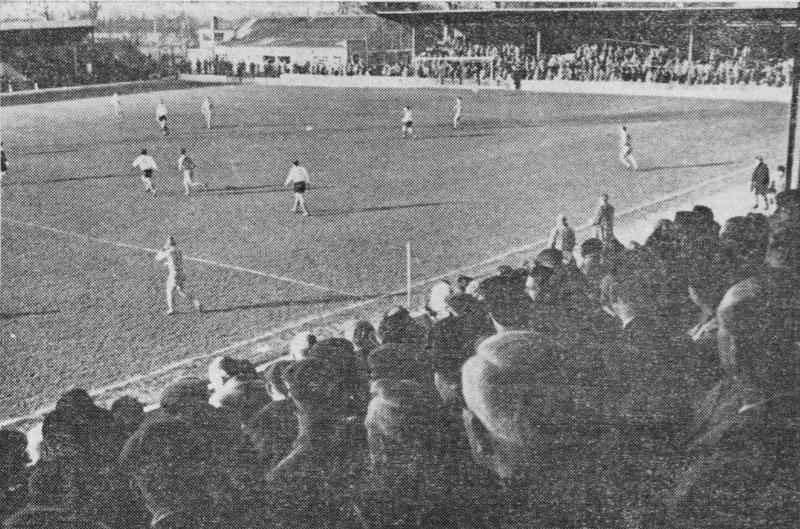 Above, view from the fully open main stand, published in the Cambridge Evening News of 26 February 1966. Right, skeleton of main stand nearing completion. Photo: Cambridge Evening News. Above, the new main stand's steelwork frame in October 1965, with the old wooden stand alongside. Photo: Len Day. Below, how the Cambridge Evenings News of 12 February 1966 reported progress. A new attendance record of 14,000 was set on 1 May 1970 for a friendly against FA Cup winners Chelsea. The following day United became Southern League champions for the second consecutive season and were elected to the Football League. The ground was given a facelift with the construction of a new press box, and the metal goalposts were replaced by a wooden set, in common with every other League club. 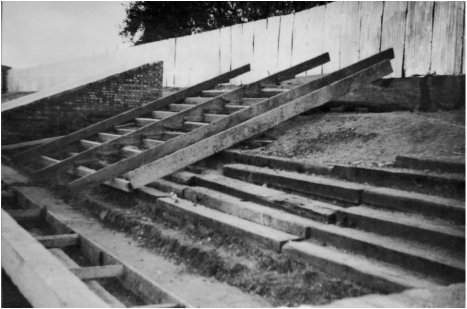 A group of volunteer supporters relaid the terracing at the Allotments End, in an echo of past generations, and Anglia Television visited Newmarket Road to arrange siting for a permanent camera position, settling on a platform slung under the roof of the Habbin Stand by the halfway line. In June 1971 the Supporters’ Club opened its substantially extended premises, including a new luxury lounge and new bars. This enabled the club to build a new spectator entrance to the left of the new building. Early in 1973 the club opened administrative offices in a cluster of portacabins in the Supporters’ Club car park, at the front of the stadium. They included new rooms for the manager and secretary, as well as a club shop, and were supposed to be temporary, but they were to stand until 2014. All tickets were now to be collected from the new reception office and not from the commissionaires on the gates as previously. In 1977 the Supporters’ Club provided £1,000 for a new roof to the Newmarket Road end (aka the Corona Kop), and the club was able to play under a fluttering official Fourth Division Champions flag, affixed to that end of the ground. Regrettably, hooliganism by Oxford United supporters in October led United’s board to decide to construct steel and wire mesh fences (soon dubbed ‘cages’) at both ends of the ground to prevent a recurrence of such behaviour; the view of spectators behind them was thus restricted. The bill would amount to another £4,000, and the ‘cages’ stayed in place for over ten years. After a second consecutive promotion, to the Second Division in 1978, 560 additional seats were installed at the front of the Main Stand, although the capacity of the stadium remained at 12,000 due to increasingly stringent safety regulations. Later that season, work began on an extension to the Main Stand, meaning the demolition of the police box and Black & Amber Shop on that side, so that it could run the full length of the pitch. 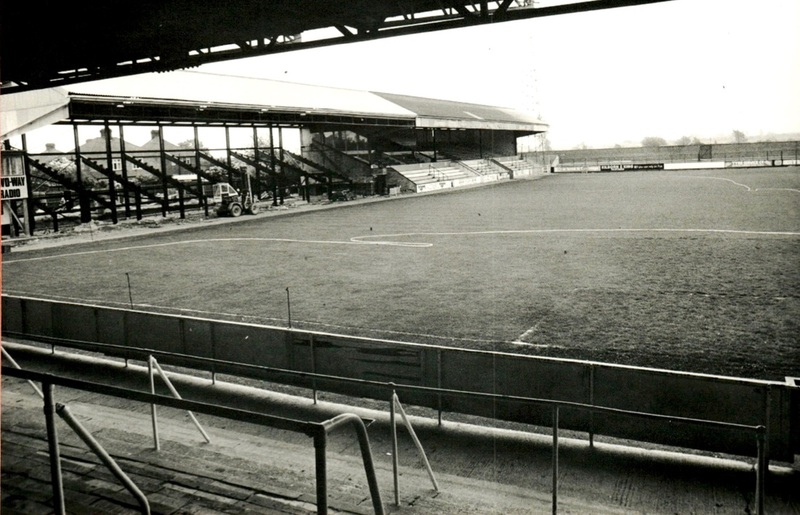 In time it began to be known as the ‘Biley Stand’ as it was effectively financed by star striker Alan Biley’s sale to Derby County. 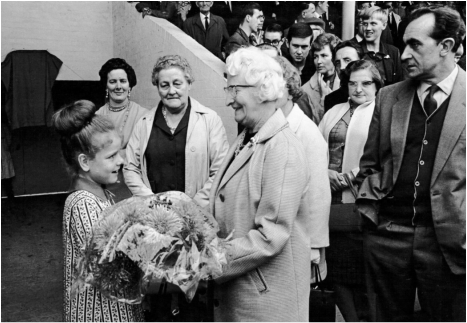 Mrs Habbin receives a bouquet from Sara, granddaughter of committee stalwart Lil Harrison, before the unveiling of a plaque in memory of Harry Habbin in a tunnel of the terrace named after him, on 16 September 1967. Harry was president of the Supporters' Club for 14 years, Also pictured, centre, is Mrs Thulbourn, wife of director Ron. 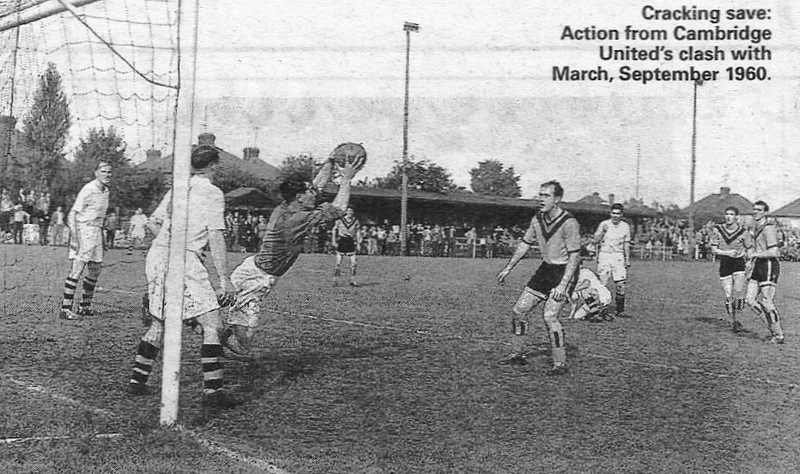 Goalkeeper Rodney Slack saves as his former United teammate Ian Hutchinson looks on, in front of a packed main stand. 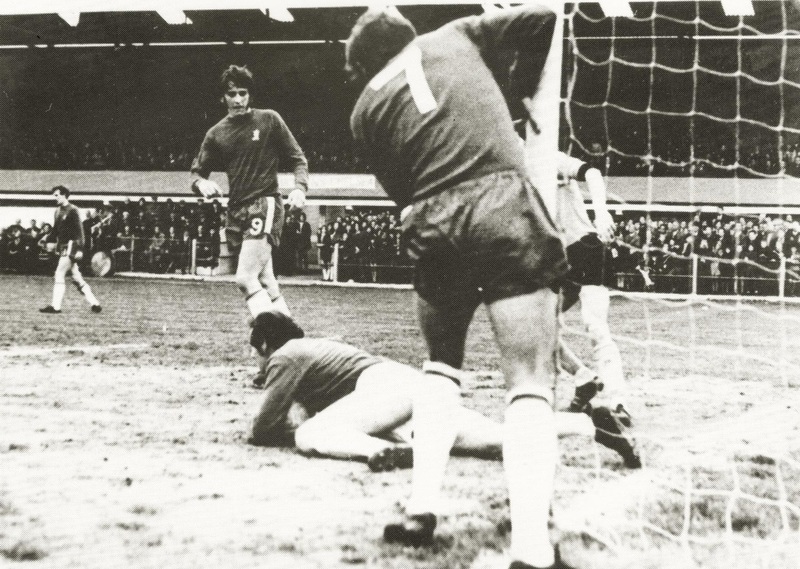 The friendly match between the U's and Chelsea, on 1 May 1970, attracted the Abbey Stadium's record crowd of 14,000. When completed in 1980, it provided 1,545 extra seats, almost doubling the stand’s capacity, and with additional terracing added all around the ground the stadium could now accommodate 14,200, although under the terms of the Safety of Sports Ground Act, capacity was set at a mere 12,500, still the smallest in the Football League. Barbed wire on top of the wall at the Allotments End, which was there to stop visiting fans sitting on it but tended to be ripped down, was replaced by revolving steel barriers. The law also made it necessary to divide the terracing into sections – Habbin, North Terrace and South Terrace – with no transfer allowed between sections once the spectator was in the ground; warning notices were posted to ensure that people entered the stadium by the correct turnstile. Those in the Main Stand were now forbidden from walking on to the track in front of it before, during or after matches except in extreme emergencies. The days of supporters changing ends at half-time were firmly in the past. 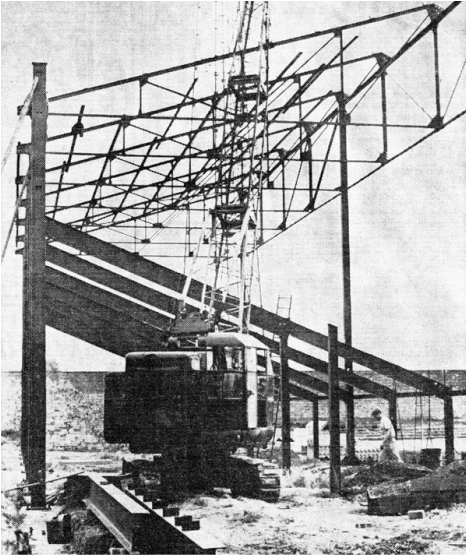 Extension to the main stand under way in the spring of 1980 – despite industrial action in the steel industry. Photo: Cambridge Evening News. Aerial view of the Abbey Stadium after the main stand extension. Note that Elfleda Road gardens extend to the back of the stand. The club spent £40,000 on ground improvements in advance of the 1981/82 season, including the installation of 376 seats at the end of the Habbin Stand nearest the Allotment End; it still left standing room for 3,500, which was left as terracing due to supporter demand. Crash barriers were also replaced by stronger ones, as required under regulations, and the car park behind the Main Stand was completed. Improvements costing £22,000 were made to the floodlight system in 1986, by which time the club had suffered two consecutive relegations. 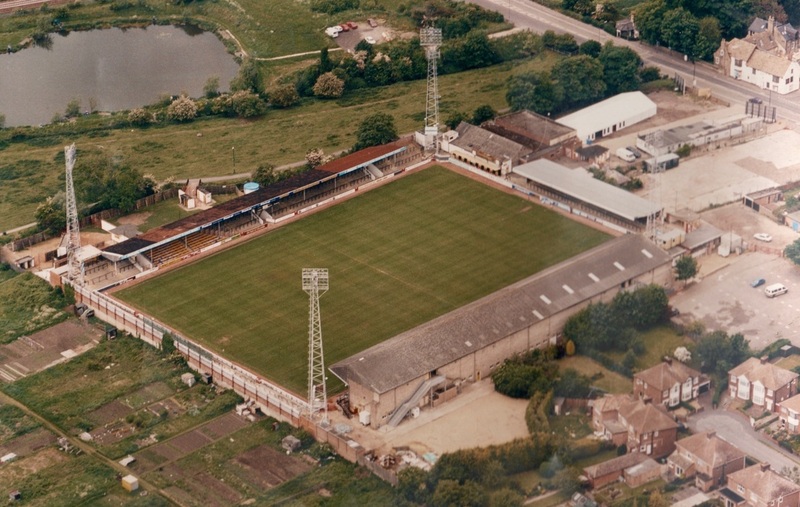 United were now severely short of money following a Football League change of rules meaning that home clubs kept all their gate receipts, and various redevelopment schemes over the next few years foundered, as did ideas of a groundshare with Cambridge City. In addition, many years’ investigation of possible sites for relocation inevitably met with opposition from the authorities. Under manager John Beck the team was promoted in 1990 and the fences at both ends of the ground were reduced in height to 2.2m, in line with the Taylor Report’s recommendations. This enabled home and away fans to bid a not-so-fond farewell to the disliked, view-restricting barriers. A new turnstile block was completed at the Cut Throat Lane entrance in November, and work was completed on a new drainage system just in time, although the turf was disfigured by multiple lines of sand the full length of the pitch where piping had gone in. The official capacity of the Abbey was now 9,998, and when the club was promoted again to Division Two in 1991 they had to find £200,000 for ground improvements, although almost half of that could be clawed back in grants. In 1992 United purchased their first electronic scoreboard for £25,000 from Rangers, with sponsorship from Cambridge Cable, and it was unveiled before a match against Derby County. The wall at the Allotments End was not strong enough to support it, so it was mounted in front of the Supporters’ Club to the side of the Corona End stand, above the ‘Tick-Tock’ terrace named after the clock above it. It thus proved unreadable for those in the Corona. The Tick-Tock became a covered area for disabled supporters. The scoreboard broke down a few years later and, in the absence of replacement parts, an advertising hoarding was nailed to it. With the team on the verge of the Premier League, and a requirement for all grounds in the top two divisions to be all-seater by August 1994, United unveiled plans to build a new 3,800 capacity North Stand and a similar one at the Allotments End, plus an extension to the Main Stand, but the team’s relegation in 1993 took away some of the urgency. Some members of a divided board still preferred to move to a new site, but the club remained frustrated in its search. Three directors boosted the value of the Abbey Stadium by buying the old Corona building next door in 1996 – although the purchase was in their own names – to strengthen the club’s position whatever it decided to do. The site was subsequently rented to the club for five years as a car park before being leased out to a car rental firm. 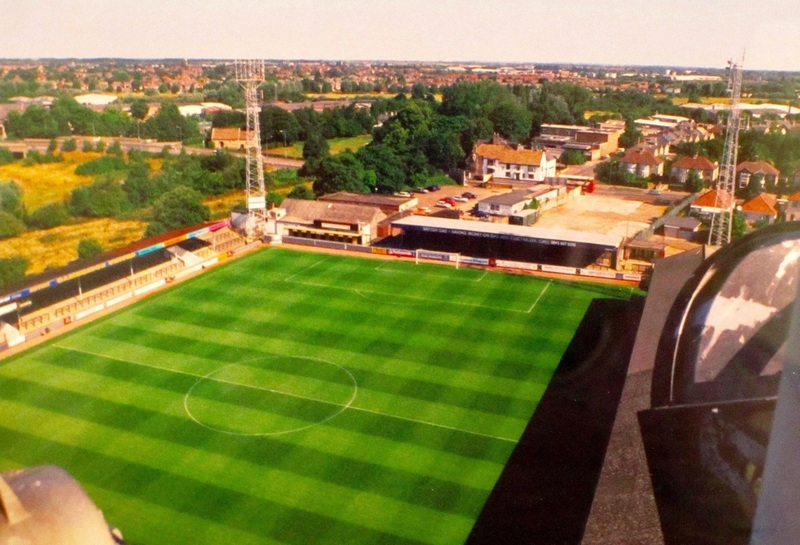 The club finally abandoned any relocation plans in 1997 and vowed to redevelop the Abbey, starting with a new North Stand and Newmarket Road frontage, then in future phases new South and Habbin Stands and executive boxes in the Main Stand. The main stumbling block to an extension southward was the presence of allotments there, and after long talks the Whitehill Allotment Society agreed to allow the club to build on some of its land in 1999, with suitable compensation and assistance in developing 14 unused plots. View of the Allotments End from Coldhams Common in the era when there were seats in the Habbin Stand. View of the Abbey Stadium from the south-east floodlight tower. Click the image to enlarge and pick out the ill-fated electronic scoreboard fixed to the Supporters' Club building in the north-west corner. ​A week later the city council’s planning committee voted unanimously to approve United’s revised plans to upgrade the Abbey to a 10,000 all-seater stadium, and in 2000 the Government rubber-stamped a ‘change of use’ permission that would allow them to build on the allotments. At the beginning of June 2001 work started on demolishing the uncovered Allotments End terrace to make way for the new 1,500-capacity South Stand, which had to be built first so that the pitch could then be moved that way to accommodate the development at the other end. 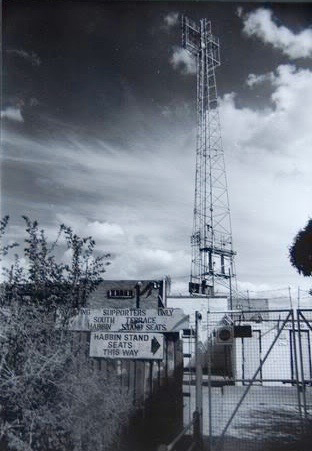 Relegation to the bottom division in 2002 and the collapse of ITV Digital meant that the club experienced severe financial difficulties, and it was stuck between a rock and a hard place, needing to complete the redevelopment to generate additional income, but unable to afford to do so. The North Stand plans were scaled down but included a hotel, health club, nursery and new Supporters’ Club. There was a shock for United in May 2003 when the Habbin Stand had its safety certificate withdrawn by inspectors, who insisted on replacement of the cladding in the roof and side of its 120-yard length, but a grant and generous backing from a benefactor ensured it was done for the start of the following season. The club’s financial position worsened considerably, though, with borrowings secured by charges over the stadium, which they stood to lose if they defaulted. Shortly after the end of the 2003/04 season work began on moving the Abbey pitch towards the new South Stand to allow for the redevelopment of the Newmarket Road end. The pitch would also be shorted by 10 yards to its former length of 110 yards. Matters came to a head in November 2004 when, in order to repay a maturing loan, the board decided to sell the stadium to a company set up by one of its directors, John Howard, for £1,923,000. Howard would lease it back to the club for a minimum of 50 years at an annual rent of £200,000, with the club having an option to buy back the Newmarket Road end for £1.35m at any time during the first two and a half years of the lease for the sole purpose of completing the proposed redevelopment, paid for by the pre-lets of hotel, nursery and health club that it had not yet found. It would then pay £100,000 rent for one and half years on the rest of the site (including the pitch), after which it would then have the option to buy back that, too, for £1.2m. Should the club not buy it back, the lease would continue and United would have first refusal if Howard wished to sell. The board felt they had no alternative, the only other option being to put the club into administration, and retention of control of the Abbey as tenants would allow the club to proceed with the Newmarket Road end redevelopment. ‘It is envisaged that when arrangements are made with potential tenants for the leisure-oriented site, the club would then have the funds to exercise its options and repurchase the ground,’ read an official club statement. However, United’s ability to buy back even the Newmarket Road end was entirely dependent on their being able to secure those vital pre-lets, and the three parties who had originally expressed interest in the hotel, fitness centre and crèche had all already withdrawn due to a downturn in the leisure market. Howard and his business partner, Stephen Clark, set up a company, called Bideawhile 445 Ltd, for the purpose of buying the Abbey, and seven directors agreed to guarantee the rental payments. Concern was raised about a perceived conflict of interest on Howard’s part; the price he had paid; the terms of the buy-back clauses; and the delay in announcing these proposals, which left the fans’ trust, CFU, only a few weeks in which to come up with a counter-proposal. The board explained this by saying they had not wished to alarm creditors. CFU failed narrowly, and the sale was approved at an Extraordinary General Meeting on November 29. View of the Allotments End between demolition of the terrace and construction of the South Stand. The South Stand as it is today. Photo: CU4ever. 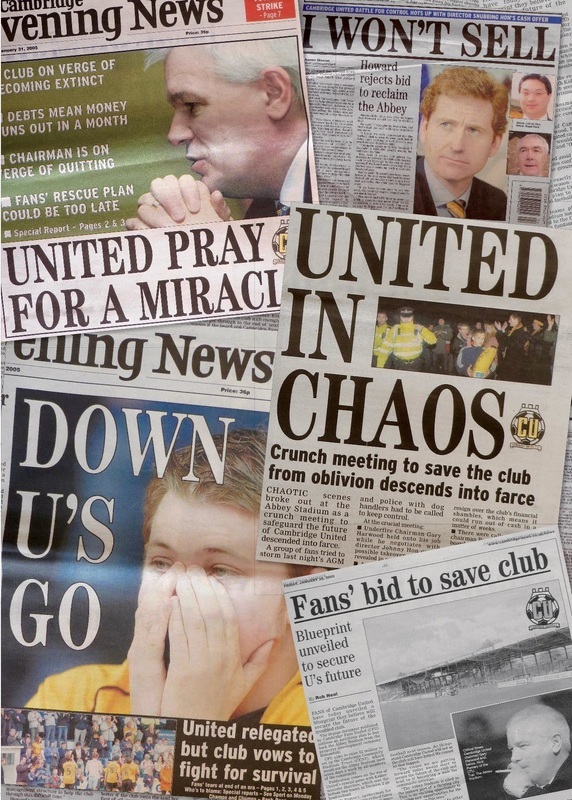 The crisis over the sale of the Abbey Stadium to director John Howard and the subsequent decline of the club into administration and relegation to the Conference, as seen by the Cambridge Evening News. Artwork: Jon Appleton. Another director, Johnny Hon, then offered Howard £2.2m to buy the Abbey back so he could make it into a community stadium in partnership with CFU, but Howard declined, saying he had his own plans for a new stadium, which never bore fruit. Ironically, the club went into administration anyway the following April, mainly because it failed to pay the VAT due on the ground sale, and only survived being wound up because of the intervention of Minister of Sport Richard Caborn. HM Revenue & Customs had tried to make an example of the club due to its opposition to the FA’s rule that football creditors should be repaid in full, in preference to others, who received 19p in the pound from United. The club was relegated to the Conference, where they would stay for nine long years. The portacabins were reclad and painted black in 2007, and a year later Amber Army motifs were painted at the back of the Newmarket Road end and the North Habbin. The naming rights to the stadium were sold for the first time in 2008 to Trade Recruitment, then switched a year later to R Costings, whose deal expired in 2015 with no immediate replacement being appointed. After another fruitless attempt by CFU to buy the ground in 2010, Bideawhile 445 sold the freehold to Grosvenor Estate for £3.5 million. The portacabins were finally removed in 2014 and replaced by a new club shop and ticket office. Grosvenor, very much a ‘friendly landlord’, have demanded much less rent from the club than Howard’s company did, and their current plans, awaiting approval, are for a major redevelopment/refurbishment of the Abbey linked to a sporting village in Trumpington. Grosvenor and Cambridge United's plans for a community stadium at the Abbey will transform a site that was once grazed by sheep. 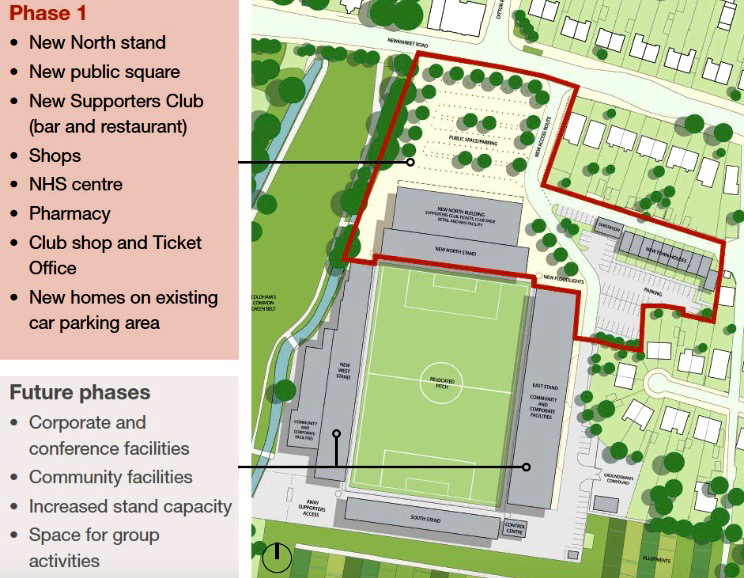 ​The plans would see the Newmarket Road End become a safe-standing terrace holding 3,500, with a revamped frontage to the ground including a civic square, new supporters’ club, club shop, ticket office and community facilities; phase two would mean a new all-seater Habbin Stand, incorporating corporate facilities, and phase three would entail a refurbishment of the Main Stand, while the Trumpington development would provide a training centre for the club and a base for its Community Trust. If approved, it will be a long way from the Celery Trenches. Above, below and bottom, views of the Abbey Stadium in August 2015. Photos: Alan Burge.